Animal Defenders International : Animal rescues : Help Simba & Rey take the final step to freedom! Help Simba & Rey take the final step to freedom! An angry mob, a 19-hour mountain journey, a specially-chartered international flight: Just three of the obstacles we overcame to take brothers Simba and Rey out of misery in the circus, home to Africa. Simba and Rey were sharing a bare circus cage in Ayacucho, a town high in the Andes mountains. Heavily outnumbered by an angry circus mob, it was a difficult seizure, but we stayed focused, and got the lions! Next, we drove through sleet and snow, high over the mountains, sleeping in our cars while Simba and Rey snuggled up in a hay bed, warm behind weather covers. The next incredible journey with these handsome boys was the Spirit of Freedom Flight, crossing the globe from South America to South Africa. Now, Simba and Rey need your help. They lived through hell and we went through hell and high water to save them, but this rescue is not over yet. 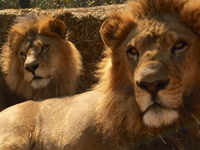 Can you help build the huge natural bush enclosure where Simba and Rey will live out the rest of their lives in paradise?